Due to Greenbird’s growth and strategic plans to increase capacity in product development of Metercloud – a SOA based Smart Metering Integration Platform – greenbird is moving to new, fresh, spacious, green-walled and stylish offices central in Oslo. The new offices will also house greenbird’s Smart Integration Lab which hosts a preconfigured demo and testing playground for with both greenbird’s Smart Metering Platform Metercloud and other commonly used integration middleware platforms. 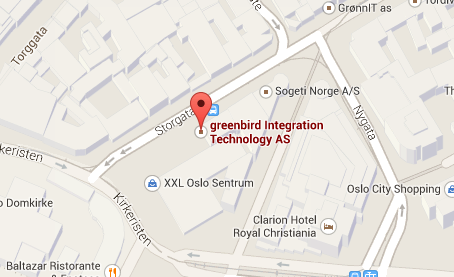 Greenbird’s new HQ address – from August 1st: Storgata 8, N-0155 Oslo. Come around, drop in and visit Greenbird or just contact info@greenbird.com.